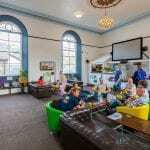 Cohort Hostel, an exciting, innovative hostel in the centre of St Ives, has just won two Gold tourism awards. One for Tourism Innovation at the Cornwall Tourism Awards and one for Best Accommodation at the British Youth & Travel Awards. Congratulations are due to the young, dynamic team behind the recent refurbishment of the Grade II listed building and it’s transformation into a contemporary, practical hostel. Cohort Hostel was conceived by husband and wife team, Lea and Dan Strickland, who used the experience of their time spent travelling and staying in less than ideal accommodation to build somewhere they would love to stay. So Cohort has fast WiFi and USB sockets throughout, the strong purpose built bunks have privacy curtains, lights and storage. The communal areas have been designed to encourage people to interact. The icing on the cake is Cohort’s enviable position in the centre of the unique town of St Ives and it’s mission to provide friendly low cost accommodation. But don’t just take our word for it, go and try it out for yourself!